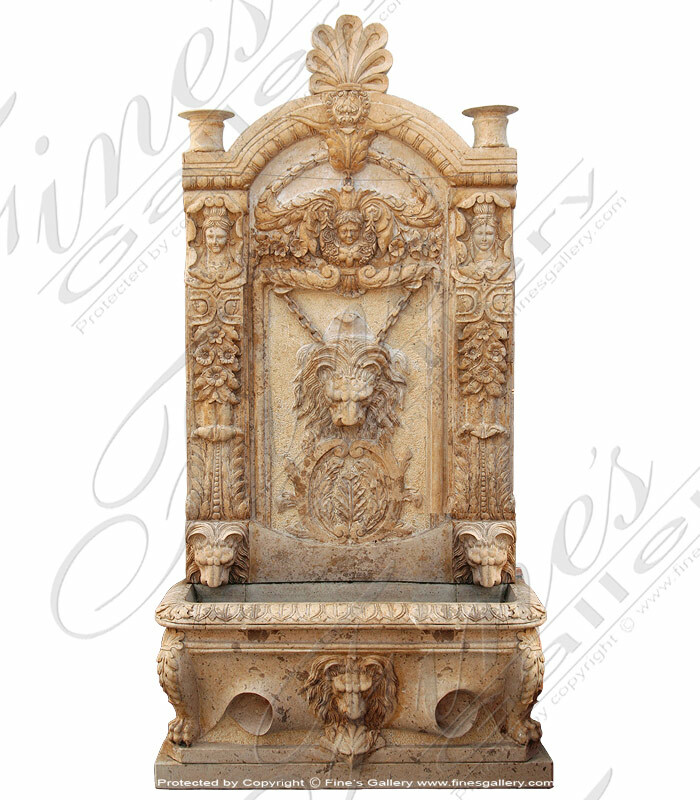 This Old World Lion Head Wall Fountain is made from aged antique calcium travertine. Beautiful floral scrollwork outlines the spectacular backsplash. The half round pool basin is available to be modified to fit your space. 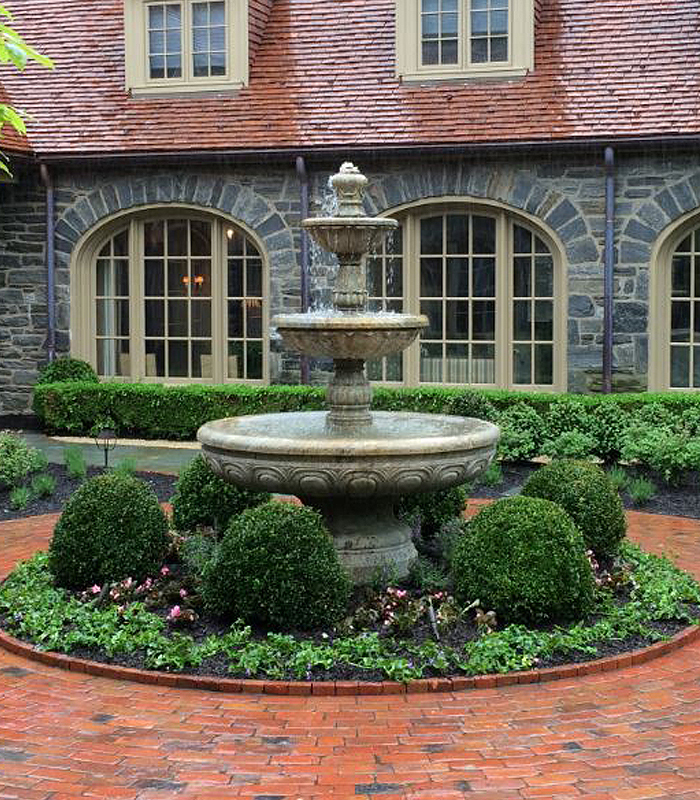 A Perfect courtyard fountain. 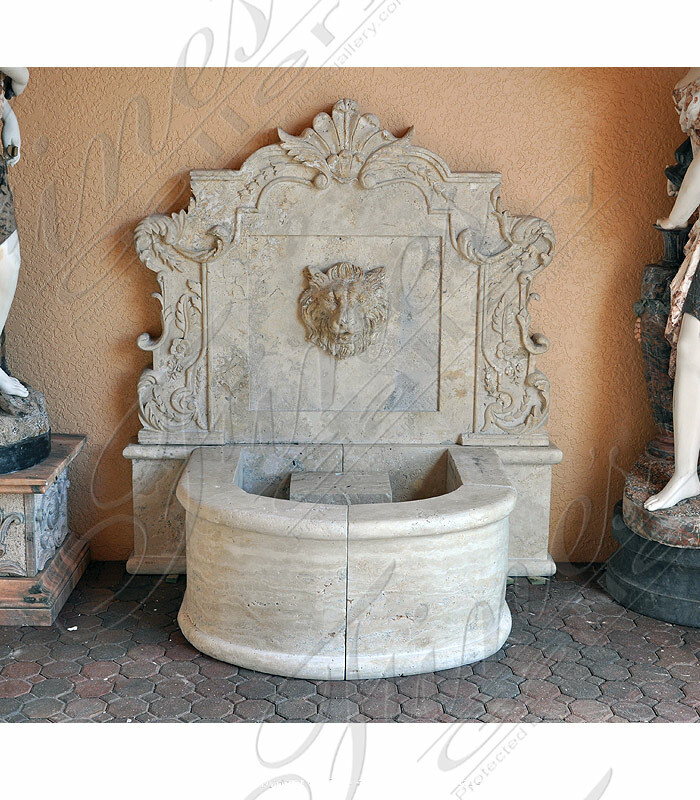 This european inspired Apuan Alps White Marble Wall Fountain is carved from natural solid statuary white marble. 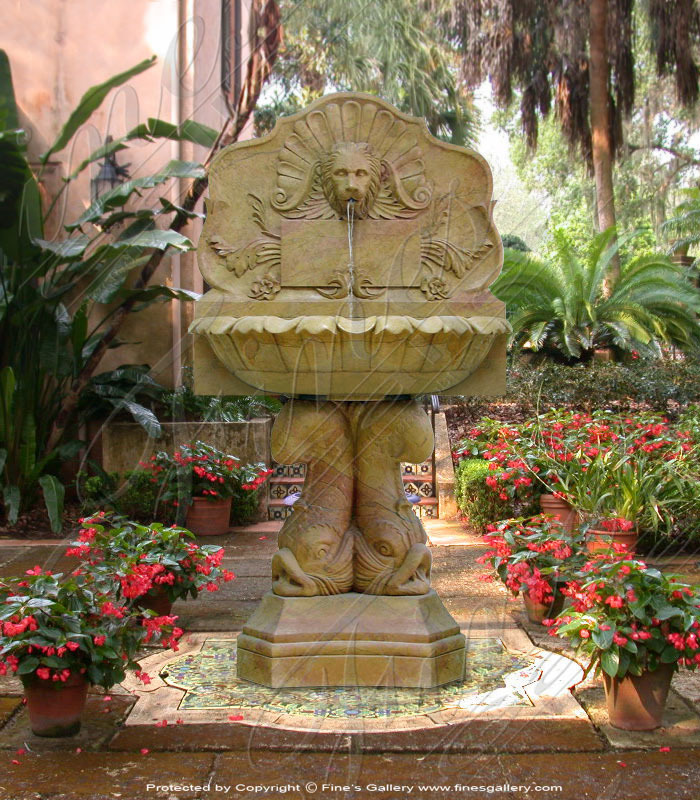 A tuscan style garden fountain feature. Our massive US based showroom can be viewed by appointment. Call us today 1.866.860.1710. Two tones of gorgeous marble are combined to create this magnificent work of art you will enjoy having among your intimate surroundings. 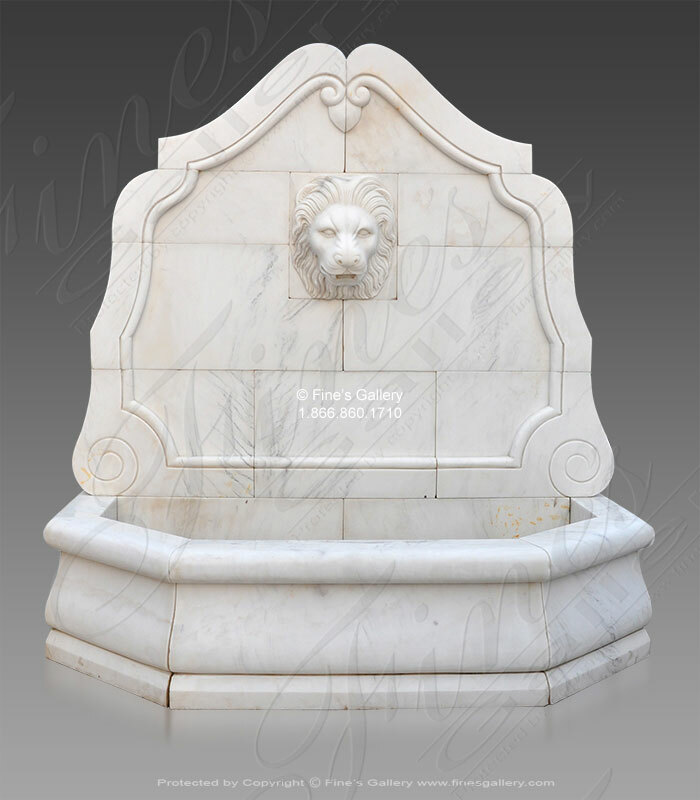 A majestic lion head in white marble is centered upon a lavish floral decor Rosetta marble wall and matching pool. 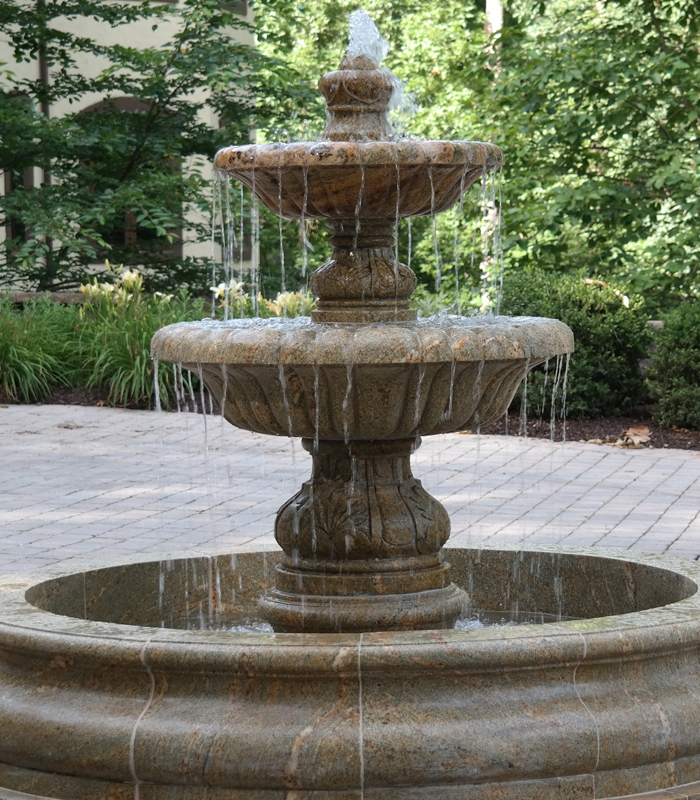 A gorgeous wall fountain to display proudly in your yard. 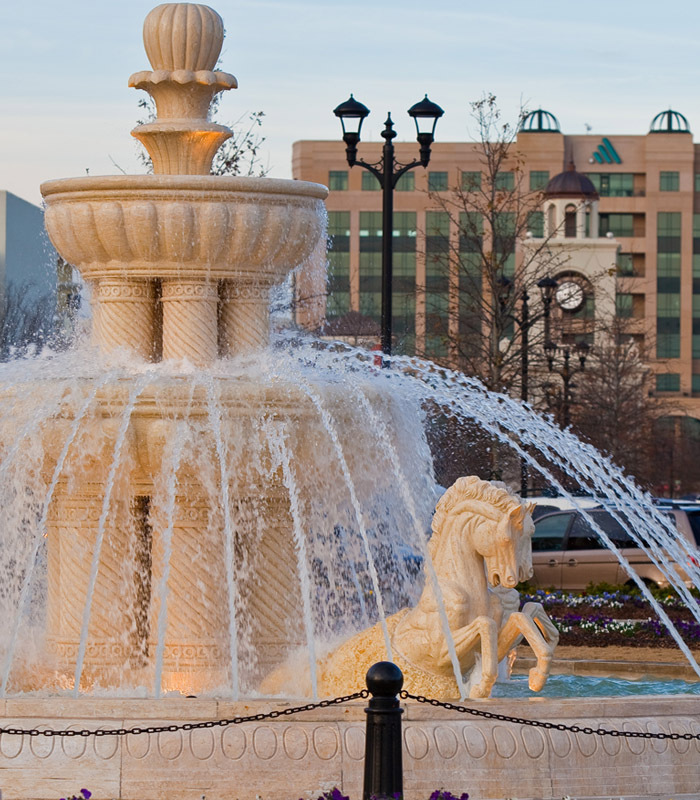 Notice the stunning 3-D hand carved fruit that makes this fountain irresitible. Also features lion head, floral and scroll-like detail. You will enjoy this funtional artwork for years to come. 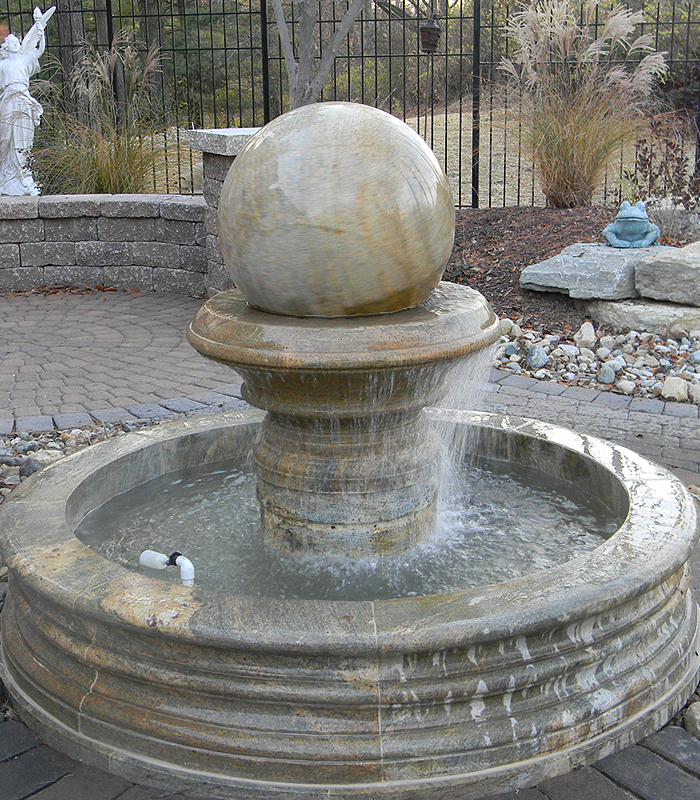 Thismarble wall fountain can be placed indoors or outdoors. 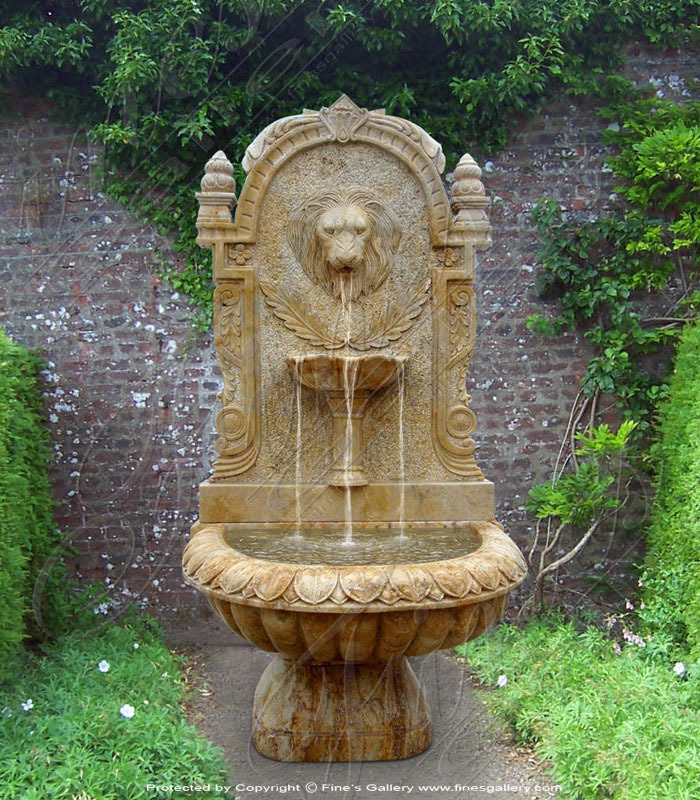 The water comesfrom the lion's mouthand flowsinto a flower shaped basin below, supported by two large fish. 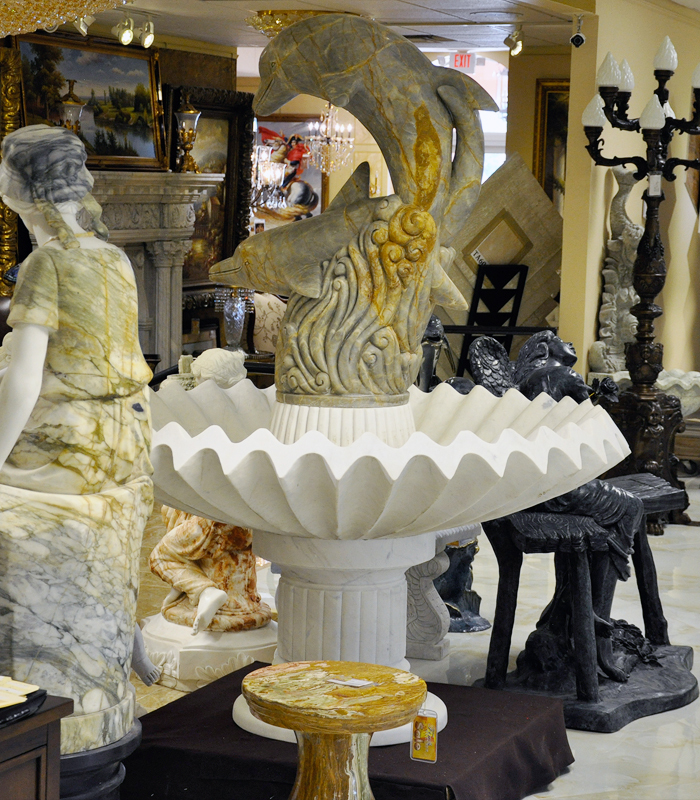 This charming marble wall fountain is hand carved by our master craftsman out of a beautiful Rosetta marble. Featuring lions head, violin, floral designs and a mix of balanced ornate patterns and designs. Enhance the beauty of your home, garden or pool. 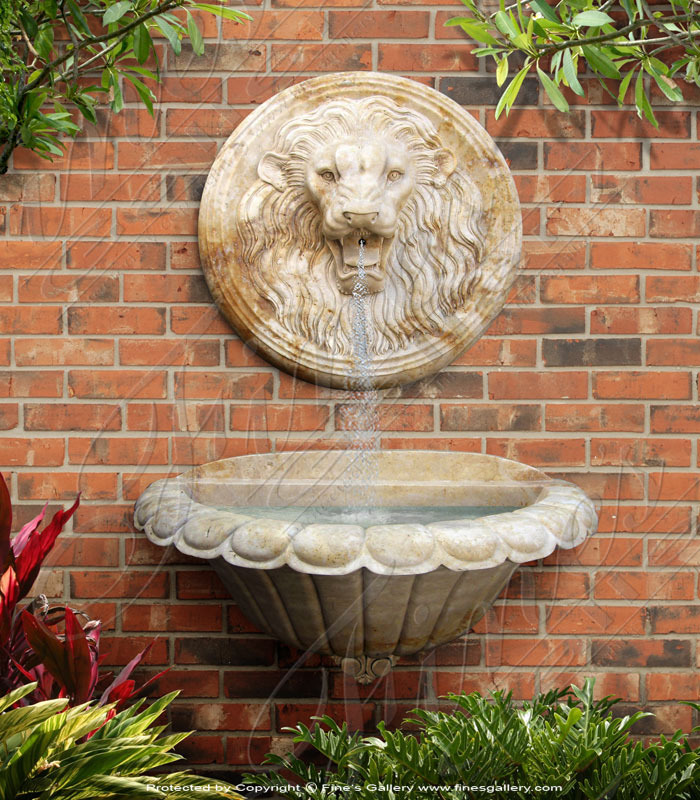 Enjoy an oversized wall fountain detailed with intricate relief work and lion water spouts. 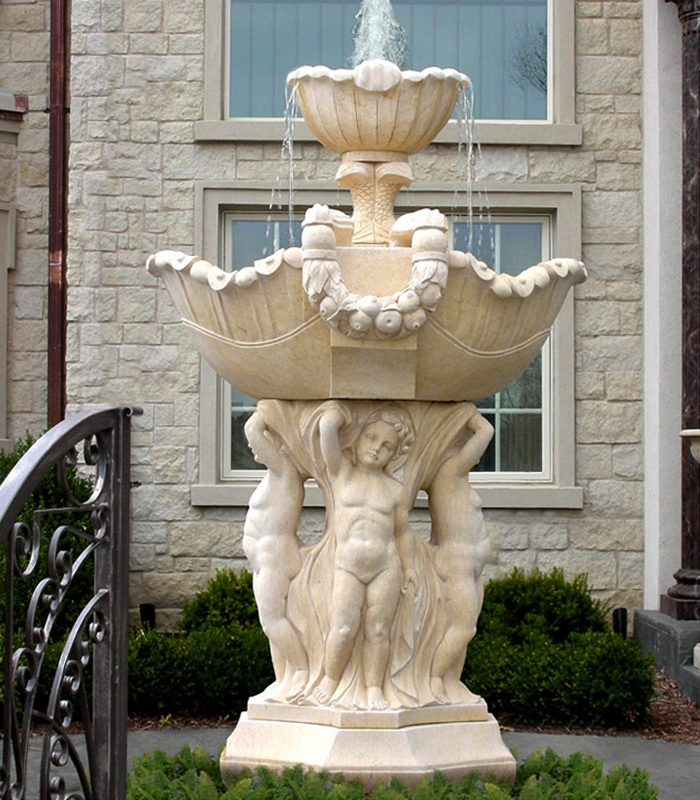 Carved in marble, this fountain will add new life to any wall and astonish guests as they wander throughout your garden. 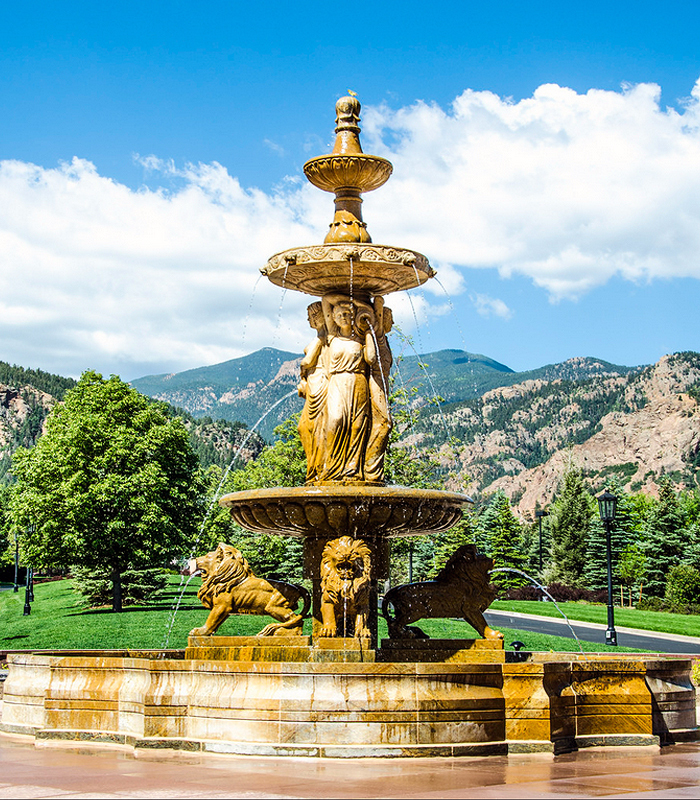 Beautiful sandstone fountain. Preowned, priced as is. 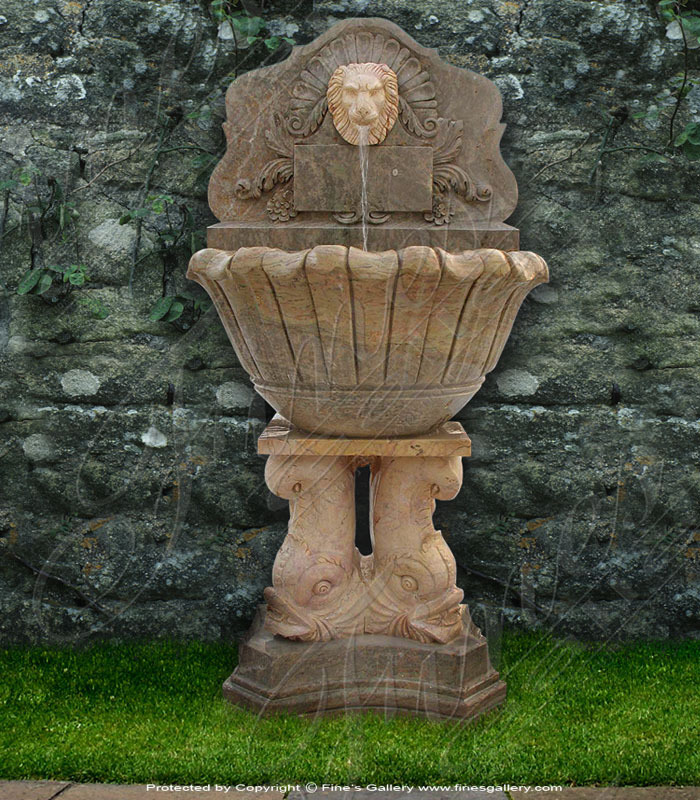 Create delightful allure and mystery in your garden with this splendid wall fountain. 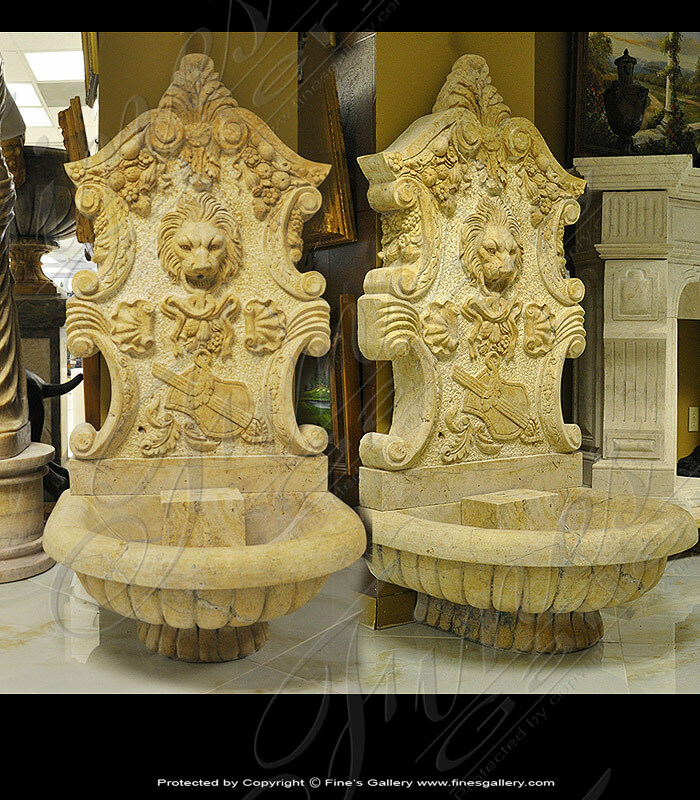 Excellently designed in genuine marble with all hand carved floral patterns, lion head, and two mythical fish as a base. We also customize this to suit your needs. 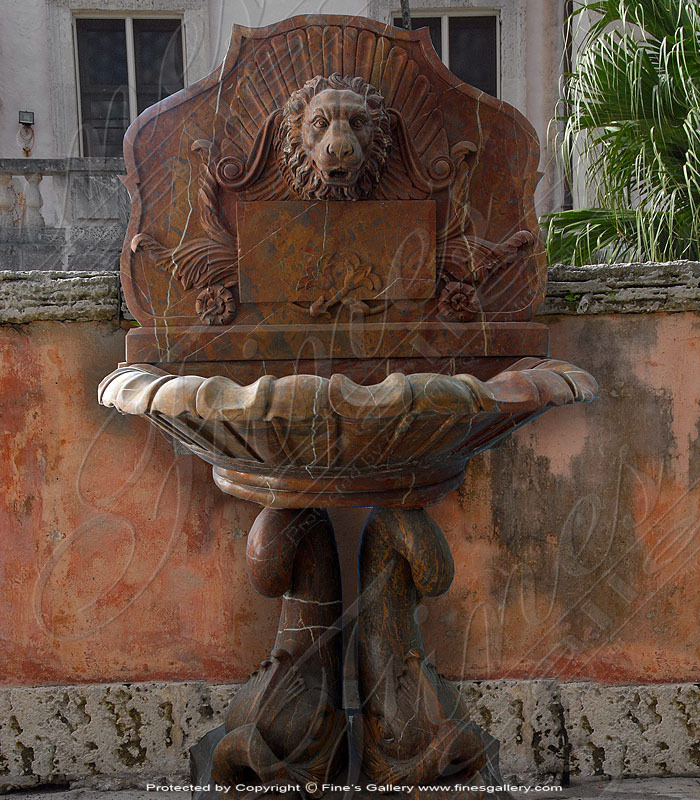 A powerful image of a lion peers out from this easily mountable marble fountain, as water gently pours from his open jaw. 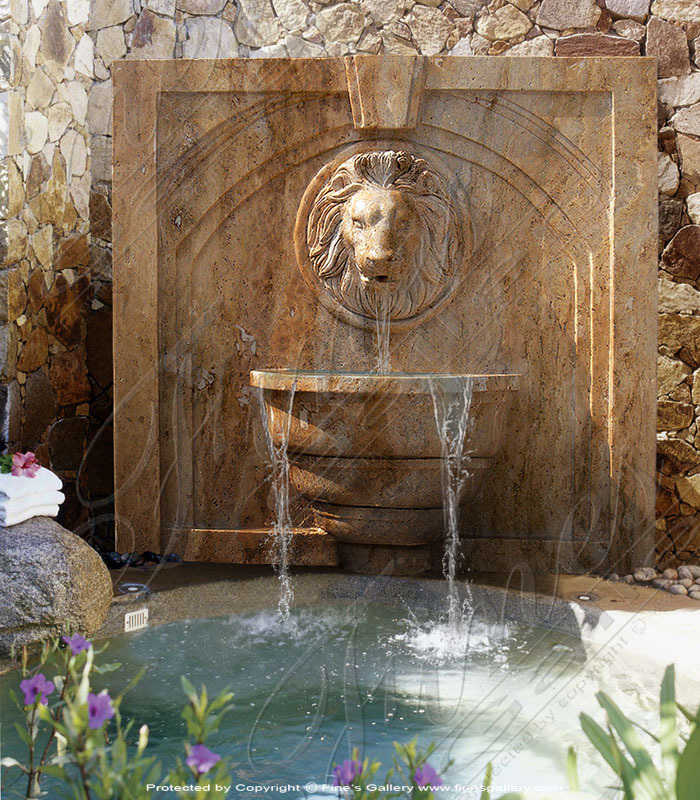 Professionally hand-carved into a brown tone marble and including a scalloped pool to catch the water. Call us for more details. 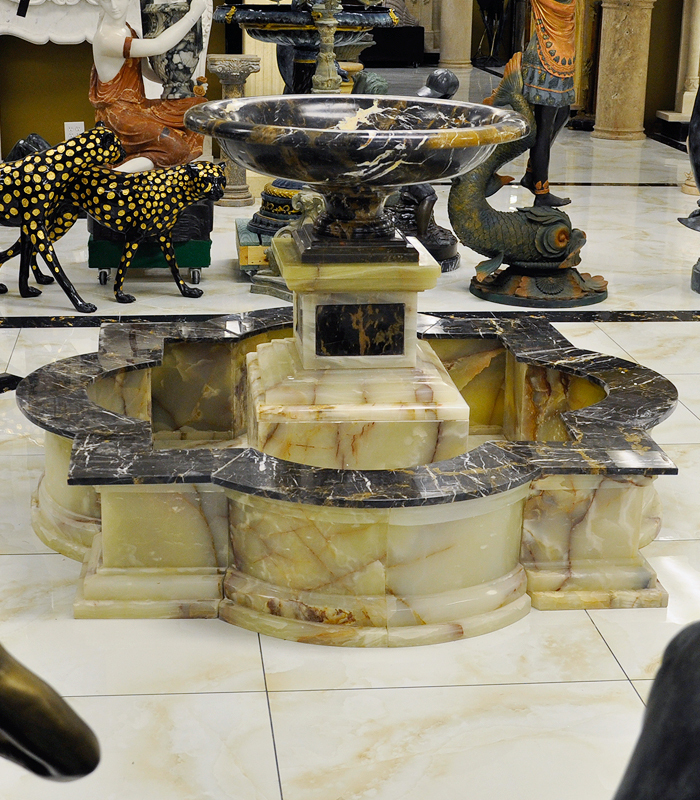 This beautiful marble wall fountain might be just what you are looking for. 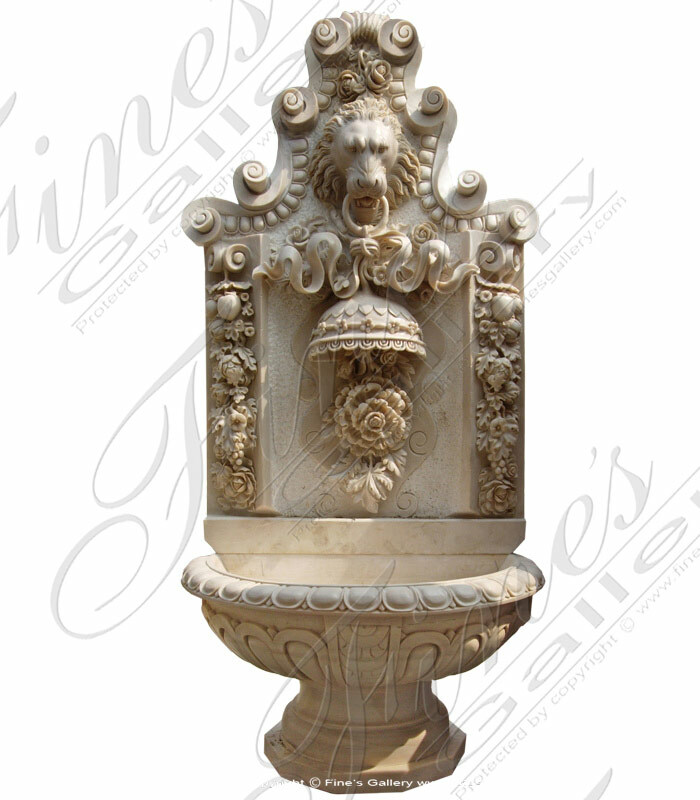 Hand carved in our antique calcium marble and featuring lions head carving, floral designs/patterns and more. Contact us today. 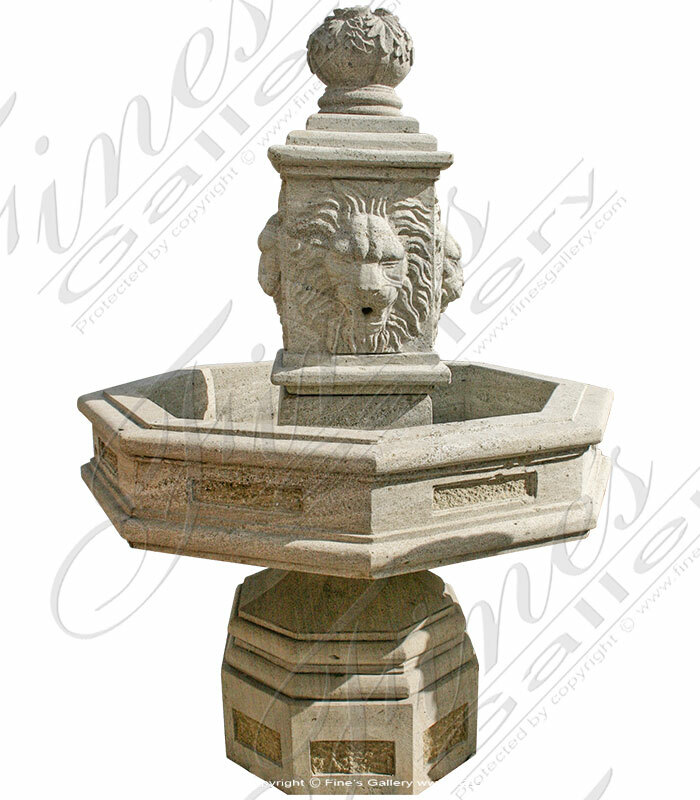 This marvelous wall fountain features a lion bust along with simple yetstylish carvings throughout. 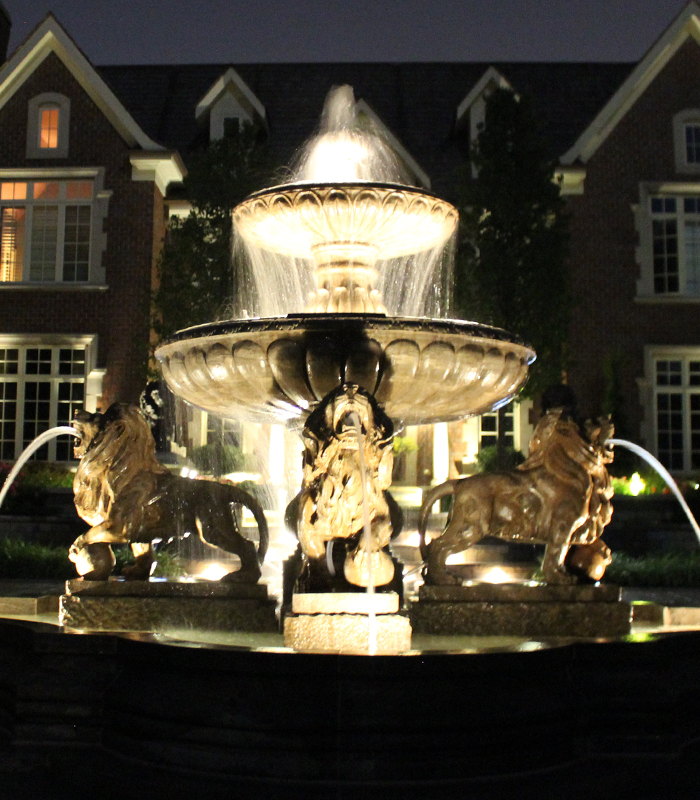 Hand carved from luxurious and rich tones of brown marble. 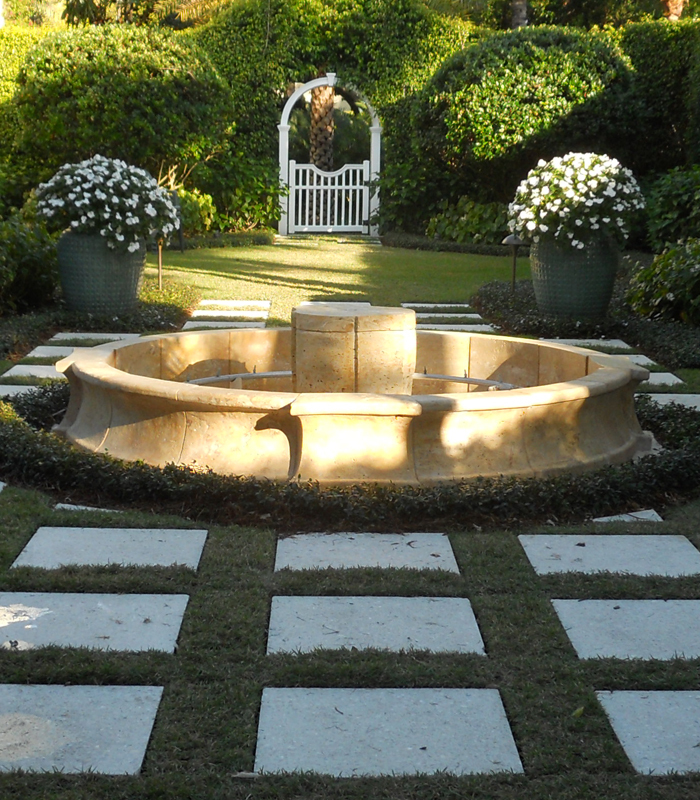 This makes an exceptional outdoor accent. Contact us today. 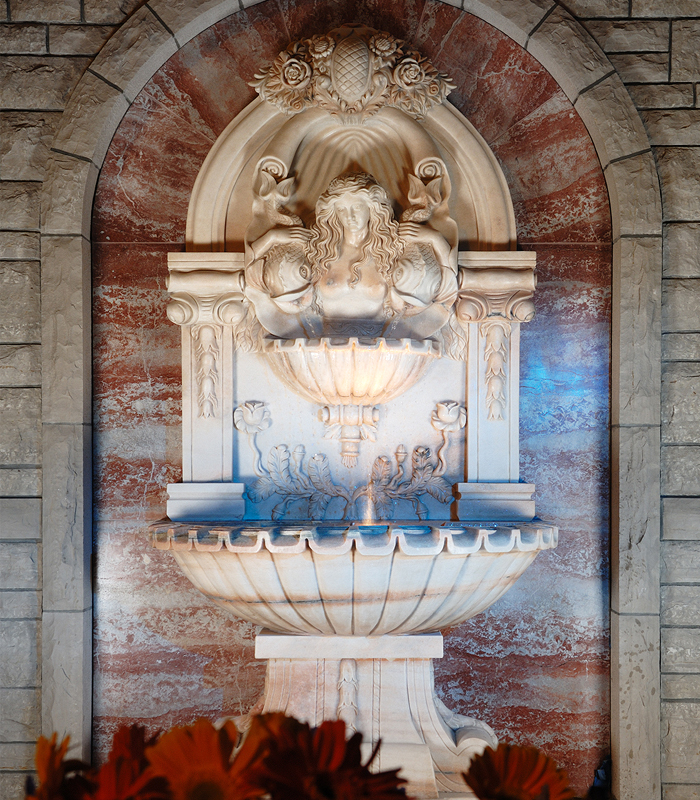 Light peach contrasts with brownish gray marble in this elegant wall fountain for enhancing the beauty of your home. 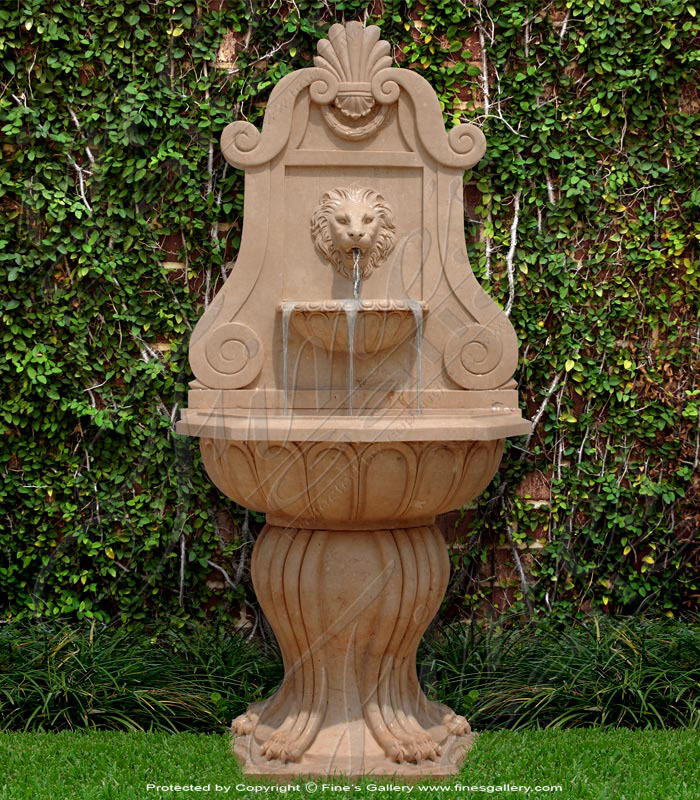 The base is made from two mythical fish supporting a deep basin that catches water from a lion figurehead. 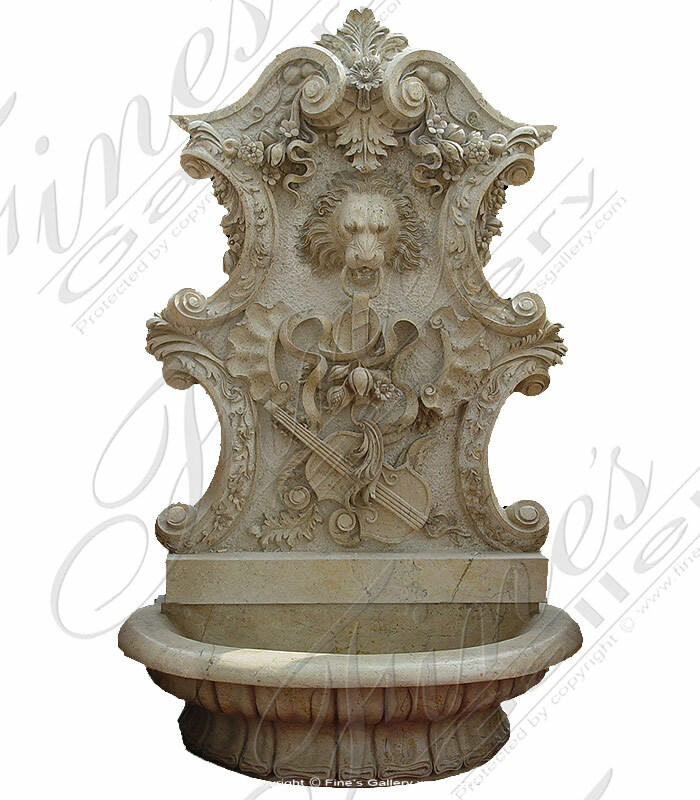 This Mythical Fountain delights all with its playful cherubs, regal lion head, and overall immaculate artistry. 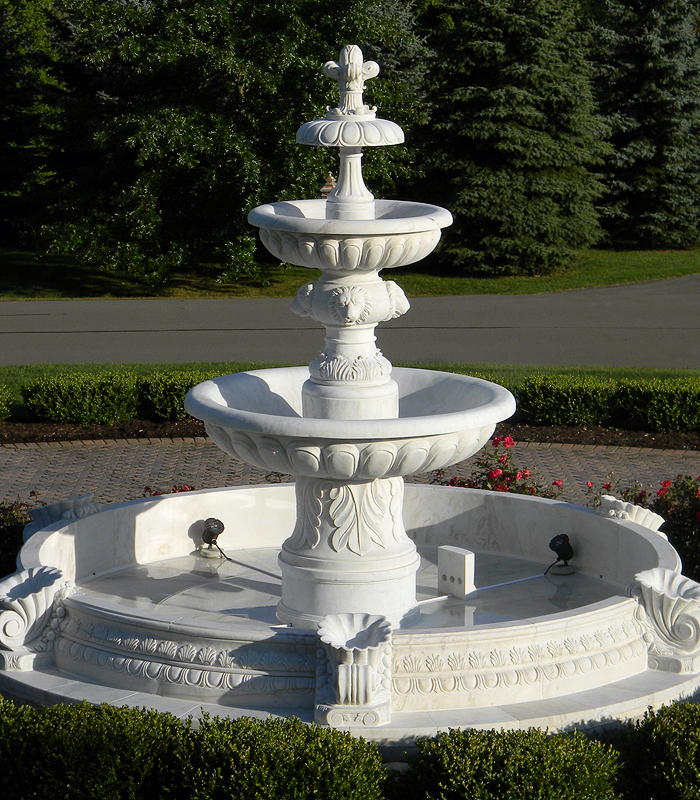 All hand carved by our team of in-house experts in this fountain abundant with floral beauty. Place this in your garden and enjoy for years. 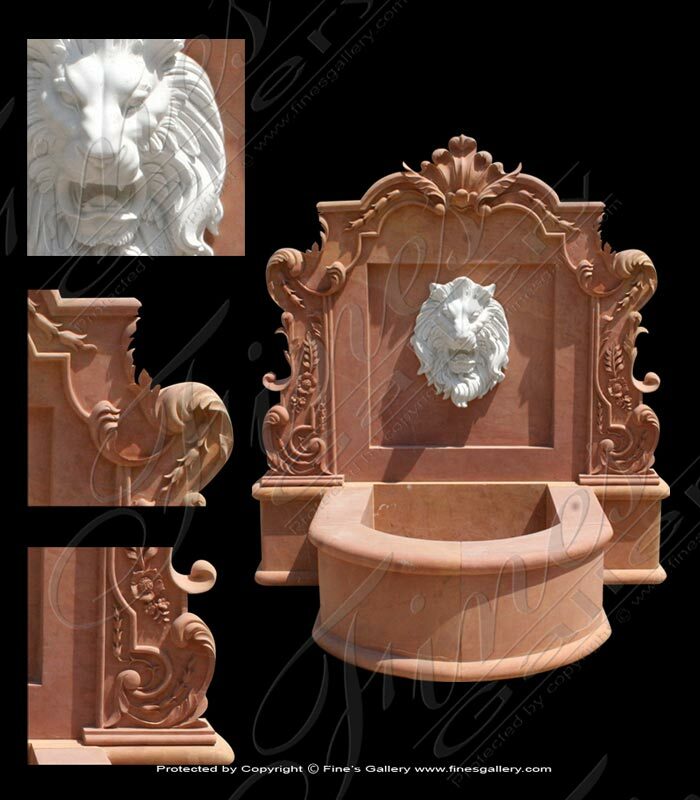 A lion head andlavish fruit, floral, and violin decor are displayedwithin reddish and beige tones of fine European marble. Water pours from the lion's open mouth into a delicate red basin below. A rare andantique piece for your home. 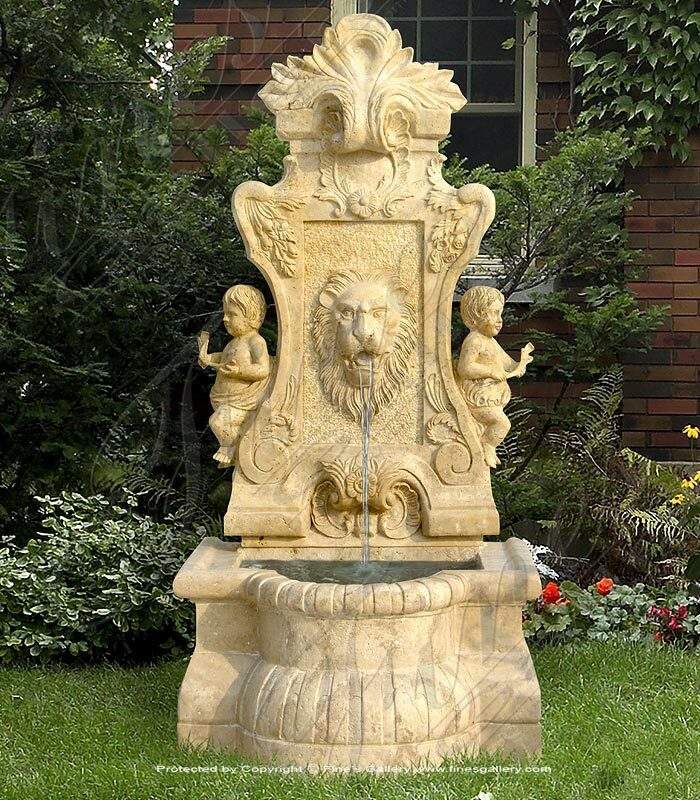 Thislavish Marble Fountainhassignature beauty for enhancing your yard or garden.An elegantlion figurehead spills a gentle stream of water into shell shaped basin, and three streams flow into a second larger basin. Contact us today.